Your bookkeepers should be efficient enough to find his way in the thickets and thickest of paperwork, able to pick on the minutest details so that little gets overlooked or miscalculated. There is a certain level of detail-oriented sharpness you’ll require from your bookkeeper so that your books can be as organized and clear as they can possibly be. You’ll need your reports properly outlined so you don’t miss out on payment deadlines, tax review schedules, or any other financial matters important to the company. As much as you should value an employee who gets right on the job as soon as he is oriented, you’ll need to make sure, too, that he is capable of communicating both the details and the overall picture to you. When there’s a problem, he should be able to show you where the problem is, and be able to communicate effectively the source of that problem. He gets your attention immediately, instead of letting the matter fester for days or months. 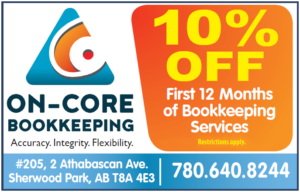 The bookkeeper you’ll want should have the basic, as well as specialized knowledge of the industry, to be able to deliver efficient and reliable Edmonton bookkeeping services to meet your needs. Firms like On-Core Bookkeeping Services have been providing many companies from various industries trustworthy bookkeepers to service their business needs efficiently.